I popped down to the Distillery a little earlier this time around to get some photos in before the crowds arrived. 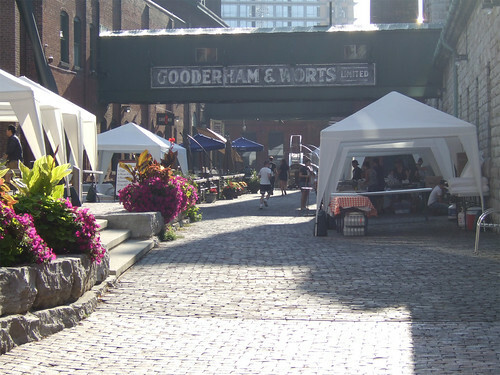 It was another gorgeous day weather-wise and as I arrived, vendors and trucks were already setting up. I always love the quiet lull before the storm, when everyone is just working away and helping each other out, making sure all the final details are in place. It also allowed me to preview each vendor's menus so that I could mentally map out my game plan for the day. Many people had complaints about the last Food Truck Eats—the layout was terrible, the line-ups were too long, the food sold out quickly. It was the first event in Toronto of its kind, and naturally, it was a learning experience. The organizer took heed of the feedback, and trust me, this was a much improved event. All the trucks and vendors were spread out throughout the whole of the Distillery. The big trucks were placed in the main lane way and the South parking lot, while the smaller trucks and vendors were sprawled out in the alleys. This meant that the crowds and line-ups were spread out, and wouldn't cause the same kind of congestion as last time. Trucks were also told to have enough food to feed at least 1000 people, while vendors at least 750. 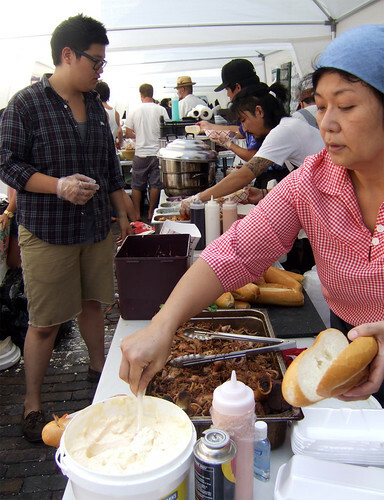 The trucks and vendors also learned a lot from the first event, and I found that many of the line-ups went rather quickly because everyone had a solid plan and were dishing out food to the masses at a much faster pace. Other new features for this event was introducing a VIP access. 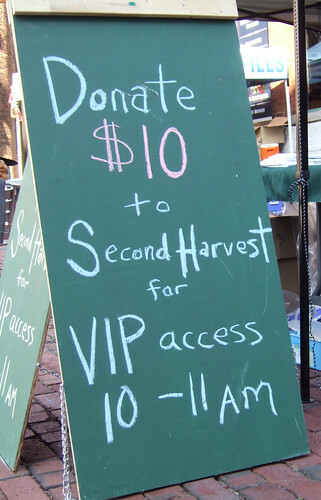 For a mere $10 donation to the Second Harvest, you received a wristband and got VIP access to the trucks and vendors between 10-11 AM. This was a great opportunity for those who didn't want to wait in long line-ups to get a head start, while helping a fantastic cause. Second Harvest delivers fresh surplus food (i.e. fruits, vegetables, dairy products and meats) to those in need, delivering the food to over 200 social services agencies in Toronto. With my wristband on, I headed to the El Gastronomo truck first. 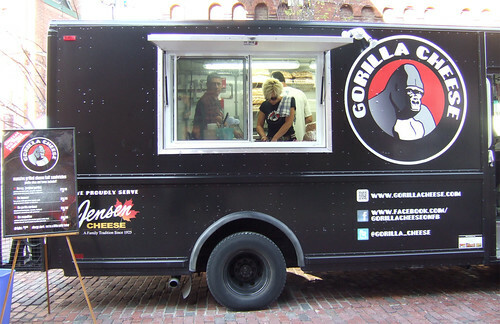 I ate from the El Gastro truck at the first Food Truck event and was thoroughly impressed, which lead to my going to check them out one weekend at Flat Rock Cellars. It was my trip to Flat Rock where I tasted their corn fritters and oh my goodness, were they delightful. Crispy on the outside, light and fluffy on the inside, and drizzled with a fantastic hot & sour sauce. They were absolutely divine and I found myself occasionally thinking about them. 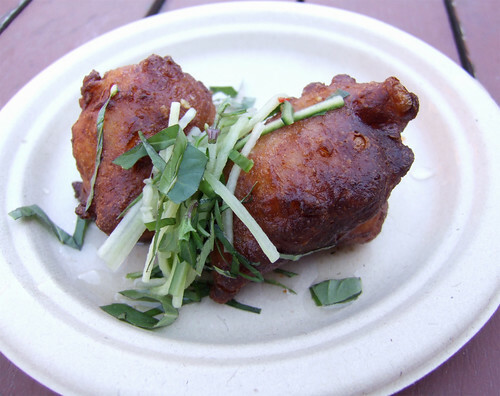 So I was thrilled to hear that they would be serving the corn fritters at Food Truck Eats so I could get my fix. I was also very excited to finally get to try La Carnita tacos. There has been so much buzz about them, and often I find myself following the tweets at lunch time when they pop up in the city. 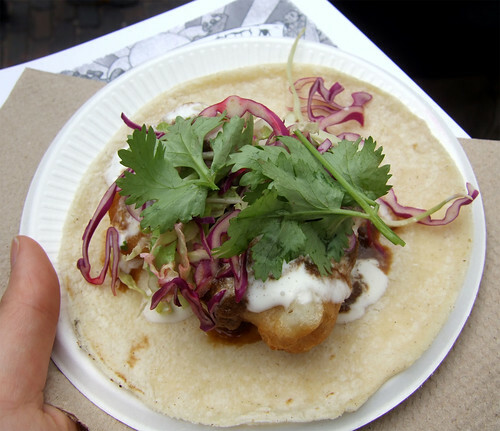 I tried their Voltron Fish Tacos—deep fried pieces of beer-battered Pacific cod with Voltron sauce (I have no clue what's in the sauce, but it was delicious). I can definitely see why there's been so much hype around these guys. Many people I was talking to that morning were also telling me to go try the Ginger Chicken Dumplings from Vanessa of Aphrodite Cooks and Joanne. I'm glad I heeded to everyone's advice because they were delicious and reminded me of my mom's own dumplings (which is saying something because my mom makes pretty awesome dumplings). 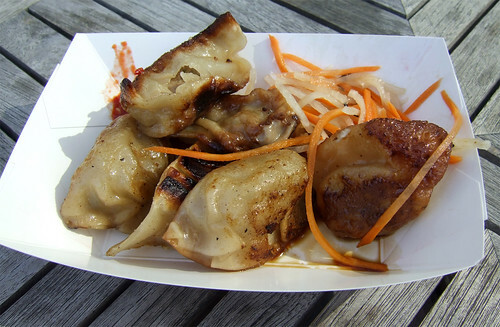 The chicken makes these dumplings lighter and leaner, and you get a slight zing in the end from the ginger. Total comfort food. 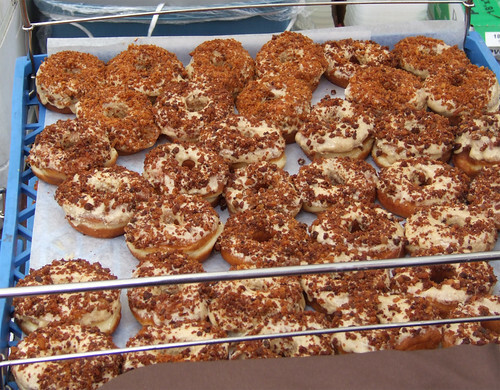 Lots of other foods were sampled, including Cajun catfish taco from Simple Fish & Chips, Vietnamese Coffee ice pop from Augie's, Olliffe Butcher's Piri-Piri Chicken Sausage, shortrib taco from El Gastro, empanadas from Supi Cucu, and a maple-bacon doughnut from Po'Nuts (a.k.a. Beast) that came home with me. Oh, and that "secret" vendor? It was Swish by Han, who came with some yummy Korean fusion treats like Korean pulled pork "banh mi," steamed pork buns, and pork neck tacos. Rumour has it that 10,000 people showed up for Food Truck Eats, doubled the number of the first one. A couple of Toronto City Counsellors made it out, and even Food Network's Bob Blumer came out to show his support. 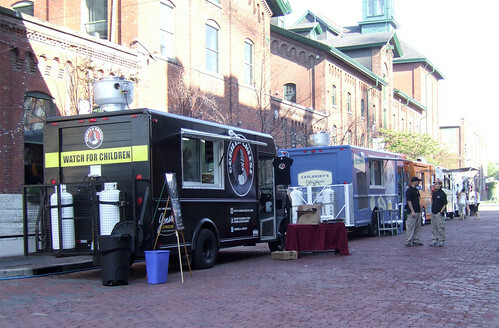 If the message wasn't made clear the first time, it's loud and clear now: Torontonians want food trucks on our streets. None of this would be possible without Suresh Doss, the man behind both Food Truck Eats events and really, the voice behind the food truck movement here in Toronto, along with the participating trucks, vendors, sponsors and the wonderful volunteers who helped out on Saturday. It was these wonderful people who made the event run so smoothly and flawlessly, so thank you!!! If you couldn't make it out to the first 2 events, there's still one more opportunity to check out the food trucks. They'll be back again on October 1. 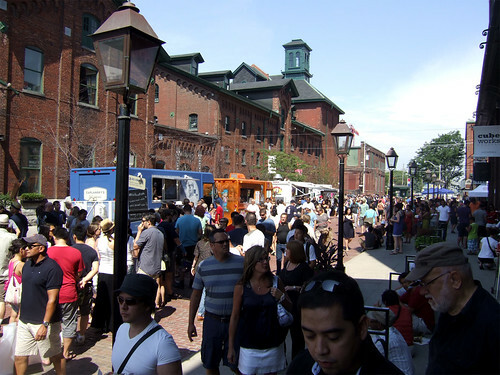 Be sure to follow www.foodtruckeats.ca to get the latest details. Be sure to check out my full photo set from Food Truck Eats here! kiki's B.F.F August 22, 2011 at 6:21 p.m.